Be the first to share your favorite memory, photo or story of Moses. This memorial page is dedicated for family, friends and future generations to celebrate the life of their loved one. 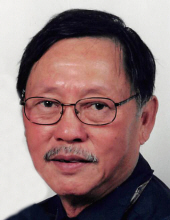 Moses T. Wang, 83, husband of the late Helen Wang, passed away on April 7, 2019 after a short illness. Moses will be remembered by his children, Laura Williams of Hamden, Joyce Danega of Victorville, CA, Stephanie Wang-Galaske of Lake Havasu City, AZ, Roland Wang of North Branford, and James Wang of Los Angeles, CA; siblings, Aaron and Donald Wang, Winnie Lim, and Helen Lim; grandchildren, Zoe, Zacharie & Seth Danega, Allison, Marissa & Natalee Wang, Ian & Mia Wang, Haven & DJ (Donald Joseph) Galaske. Predeceased by his siblings, Mary Sumkian and Miriam Kesuma. Moses was born on October 24, 1935 in Shanghai, China to the late Hou Ren and Minnie Wang. He was educated at Chapman University and Loma Linda University in California as an X-Ray Technician. He worked in his field at various facilities for 54 years. He will be missed by his family, friends, the church community he served, and especially his many grandchildren. Friends may visit with his family on Thursday, April 11th from 3:00 to 5:00 p.m. at BEECHER & BENNETT, 2300 Whitney Ave., Hamden followed by a service at 5:00 p.m. in the funeral home. Moses’ family would like to invite friends to join them after the service at the New Haven Seventh-day Adventist Church, Humphrey St., New Haven, for refreshments. To send flowers or a remembrance gift to the family of Moses T. Wang, please visit our Tribute Store. "Email Address" would like to share the life celebration of Moses T. Wang. Click on the "link" to go to share a favorite memory or leave a condolence message for the family.